GC36 Press Conference: L-R: Orlando Torres, SJ, Patrick Mulemi, SJ, Antonio Moreno, SJ, and Federico Lombardi, SJ, was held to explain the procedures of the upcoming General Congregation. 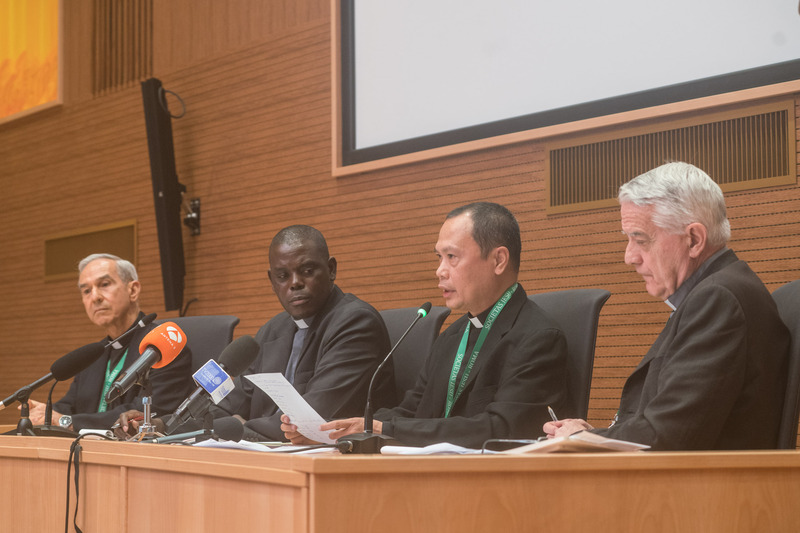 The General Curia of the Society of Jesus this morning hosted a press conference to present the 36th General Congregation which will open on October 2, with a concelebrated Mass at the Church of Gesù at 5:00 p.m. (not 5:30 as earlier announced). Introducing the press conference, Father Patrick Mulemi, SJ, director of the Communications and Public Relations Office of the Society and Spokesperson of the General Curia mentioned that today, 27 September, was the 476th anniversary of the establishment of the Society of Jesus. The Holy Father, Pope Paul III signed the Bull Regimini militantis ecclesiae on 27 September 1540 approving the establishment of the Society of Jesus. Father Mulemi went on to present the renovations that have taken place in the aula. He pointed out the four artistic panels, which were painted by Father Marko Ivan Rupnik, a Slovenian Jesuit artist. The paintings draw inspiration from the Scriptures and the Exercises of Saint Ignatius. Father Antonio Moreno, SJ, provincial of Philippine Province and member of the GC 36 Coordinating Committee, explained the process of preparing for the General Congregation, which was convoked by Father General Adolfo Nicolás. He mentioned that Father Nicolás has announced his intention to present his resignation to the General Congregation, which is the supreme governing body of the Society of Jesus. Father Orlando Torres, SJ, Rector of Collegio Internationale del Gesù explained that the process which will involve 215 Jesuits (among whom 212 will participate in electing the new Superior General) from 66 Provinces Regions of the Society will have two main tasks: “electing a new Superior General and discussing matters of great importance for the life and mission of the Society.” The whole manner of proceeding, Father Torres explained, “is contained in the booklet called the Formula of a General Congregation. The only thing not in the formula, but the most important, is how the Holy Spirit will inspire us.” After accepting the resignation of Father General Nicolás, the Congregation will get into a discussion on the state of the Society (De Statu Societatis) which will help in providing the characteristics of the future General. This will be followed by four days of murmurationes, during which time the electors can ask for information from each other, in one-to-one conversations. During this process, it is not permitted to have group conversations. “The days of murmurationes are, as Saint Ignatius says, dedicated to prayer, recollection, and penance. It is a time of discernment.” The election of the General, that will probably take place in the second week of the Congregation, requires an absolute majority (50 percent plus 1 – thus 107 votes). Father Federico Lombardi, General Counsellor and Assistant ad Providentiam, gave some statistical figures about the Society of Jesus. He explained that “at the end of 2015, Jesuits in the world were 16,740. These comprised about 12,000 priests, 1,300 brothers, 2,700 scholastics, and 753 novices.” He observed that it is important to note that, with relation to the past, today the majority of Jesuits are from the global south: vocations are growing particularly in Asia and Africa (from where 6o percent of scholastics and novices hail), while they are on the decline in Europe and North America. “There are 5,000 Jesuits in Europe, 5,000 in the Americas (2,600 from North America and 2,400 from Latin America), 5,600 from Asia (4,000 from India alone), and 1,600 from Africa. The percentages of participants in General Congregation 36 reflect the global percentages of the Society. Father Lombardi noted that the themes of “reconciliation with God, reconciliation with other human beings, and reconciliation with creation” are major themes from General Congregation 35, which have guided the mission of the Society of Jesus in recent years. The new General who will be elected will be the 30th leader since Saint Ignatius.